It was a busy weekend for Ballymena Runners, quite literally a case of running here, there and everywhere! No stone was unturned as the club colours were spotted in places as far apart as Orange County, California to South Shields and a cameo appearance on national television! The club were represented at the iconic Great North Run on Sunday, the largest half marathon in the world attracting some 50,000 runners to Newcastle upon Tyne before finishing on the South Shields seaside. Amongst those running were club members Neil Douglas Gillian Rennie and Adrian Dodds. Neil continued his return from injury to clock a time of 1hr 22mins 57secs, Gillian came home in 2:26:51 while Adrian made a bit of a name for himself with a piece of classic photo bombing as Olympic gold medal heptathlete Denise Lewis conducted some roadside interviews with his fellow competitors! Well done to Claire Martin who competed in the East Antrim Marathon Series 6-Hour Challenge on Saturday. Claire completed eight laps of the 4.2 mile course, clocking up a mammoth 34.6 miles in the process and finishing joint ladies winner. Well done Claire! It was a successful afternoon for the club in the nearby Tannaghmore 10k on Saturday. Also donning club colours in the 10k were Michael Johnston (47:57), Billy Bamber (49:12), Geoffrey McClean (57:20), Harry Armstrong (57:45), Janine Redmond and Sarah Woods (both 1:03:08). We just don't run the town, we also run California! Elaine Scullion was flying the flag for the club in the stifling Orange County heat as part of the LaceUp Running Series 5k, finishing well up the large field in 29:57.85 ... that's one medal no-one else in the club can boast of having! Congratulations to Cara Johnston on recording a new personal best in Sunday's Belfast Telegraph Runher 10k. Starting off at the famous Titanic Slipway, Cara completed the course in 1:19:08 and was one of a number of ladies from the club taking part alongside Kim Close (1:17:50), Maria McKeown (1:06:11) and Grace Snoddy (1:13:20). An excellent effort from all concerned given the inclement conditions. 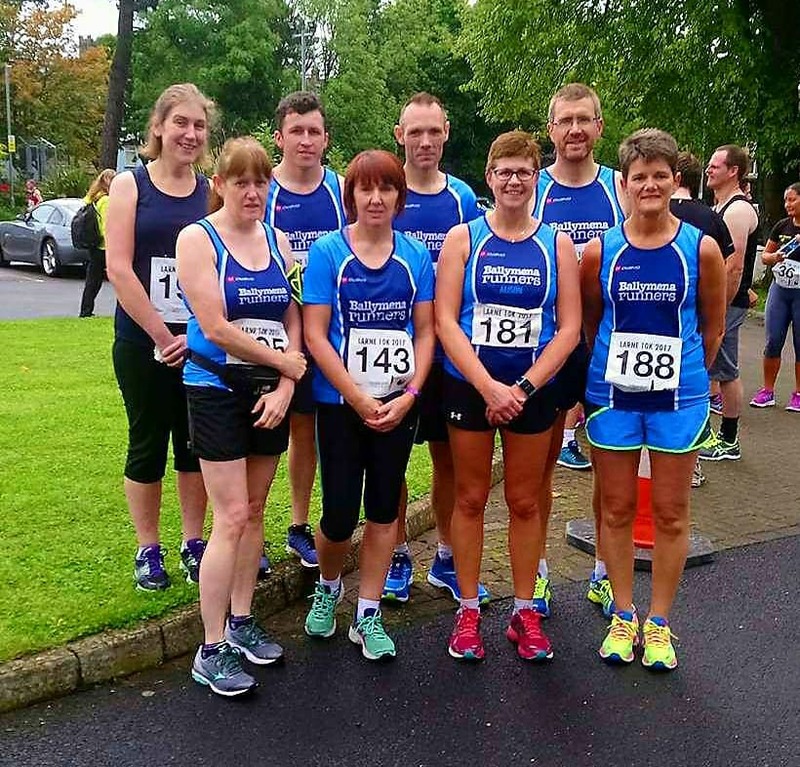 A healthy contingent from the club made their way to the East Coast for the Larne 10k and, as always, there were a number of strong performances throughout. Ben Morrow earned himself a place on the podium, coming third overall in 36:59 while Jim Moore placed in the top ten (38:28), just ahead of Nigel McClintock (38:38). Elsewhere, Linda Petticrew finished second in her category (46:33) while new club member Debbie Watters produced a storming run to set a new personal best (50:40). Well done all! There was a successful outing for Sinead Scullion on Sunday at the ALPS 10k in Downpatrick. Sinead finished third lady in 48:45 (and 12th overall) to earn a place on the podium at the event organised in support of World Suicide Prevention Day. Congratulations Sinead! It was momentous weekend for veteran club runner Roy White who, on Saturday, competed in the Rostrevor parkrun and thus collected a full set of all 24 of the free weekly 5k events in Northern Ireland. Roy has been running since 1983, and a club member since 1992, and in that time has worn the Ballymena Runners vest with pride around the world, competing in excess of 110 marathons! Aidy's cameo appearance on national television! ... and with his Great North Run medal!